Horace Mann School, the former Monroe Elementary, proved insufficient for its new location, and it was poorly insulated, making it very cold. 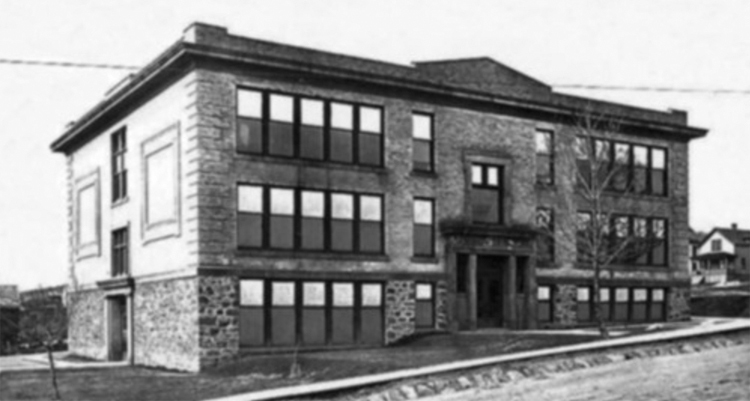 In 1908 Ensign Elementary replaced Horace Mann, and the former was sold for its lumber. The new school took its name from beloved Duluth pioneer J. D. Ensign, who joined the school board soon after arriving in Duluth in 1870. The new school stood three stories tall and was wrapped in brick; rubble stone adorned the first story, which featured a decorative column entrance and quoins at each corner. It contained ten classrooms and even had its own library. The school underwent remodeling in 1929 and served the upper West End for the next fifty years, closing in 1979. Arsonists set the building ablaze in 1981. Several houses now occupy the site.